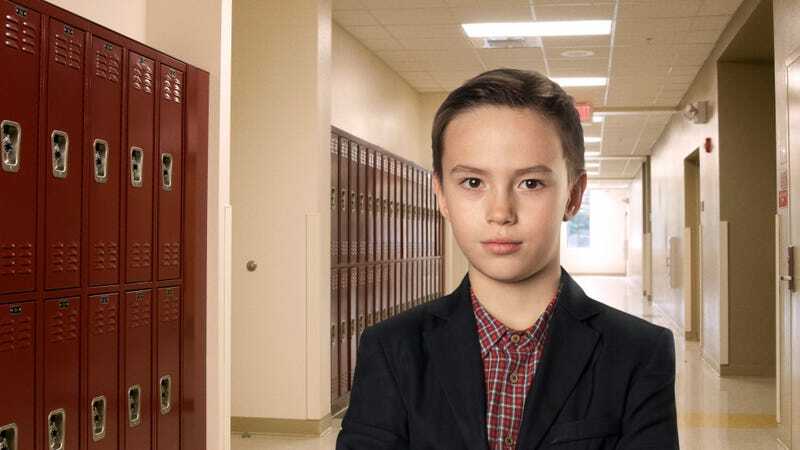 There’s an air of mystery in the halls of Monte Vista Elementary today, where rumors are swirling around one fifth grader in particular who, it seems, very well may have had something heavy go down in his life: Nathan just showed up at school two hours late wearing a suit. Damn. Something definitely must have happened. You don’t just show up to school dressed like that for fun. Sporting a black suit, a clip-on tie, and hair gel, Nathan walked into class about halfway through silent reading time this morning and silently handed Ms. Weaver a note before taking a seat at his desk, offering no explanation to his curious peers for his tardiness or formal attire. This immediately spurred a flurry of hushed speculation among the other students about what might’ve happened with Nathan, with the leading theory being that perhaps one of his grandparents had died and he had to go to the funeral. However, Caleb, who played on the same Little League team as Nathan this summer, said that he thought Nathan’s parents might be divorced, and if this were true, it could possibly mean that Nathan had to go to some kind of custody hearing this morning where he was forced to choose which parent he wanted to live with, which everyone agreed would be a huge bummer but also kind of cool because now he would get to have two Christmases. Conversely, Riley theorized that perhaps Nathan came to school late in a suit for a happy reason, noting that Nathan is pretty smart, so maybe he was at a breakfast banquet for honor-roll students or something. While that’s certainly within the realm of possibility, it honestly seems far more likely that a sad thing happened. Whatever the case, it doesn’t seem like Nathan’s in the mood to talk about it. Though he’s been back at school for more than an hour now, he’s just been sitting quietly at his desk the whole time, drawing in his notebook and avoiding eye contact. Here’s hoping that nothing too bad happened to him, or if it did, that he’ll eventually spill all the juicy details.